Chong: [on several cups of coffee, driving] It was Rock 'n Roll that killed Elvis, man! Things are Tough All Over (1982) was the duo's fourth feature length film together. Tommy Chong wasn't the director this time around. It was also their second film that was filmed in Cinemascope. Cheech and Chong are living in Chicago, They work at a car wash during the coldest winter ever. 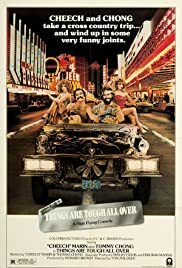 There employers Prince Habib and Mr. Slyman (Cheech and Chong) want them to deliver some goods to Las Vegas (after they screwed up several other jobs). The two want to make it up to Slyman and Habib and go on a cross-country adventure. Meanwhile two French ladies have a crush on the two and they want to have a wild night together. Will Cheech and Chong deliver the package without any troubles? Can they stay away from Habib and Slyman's wives? How will they be able to score dope whilst on the road? Just watch THINGS ARE TOUGH ALL OVER to find out!!! Not a classic, just another funny film from Cheech and Chong. Follwed by another sequel STILL SMOKING!! !